Surrounded by uncontaminated nature in the hills of Chianti, it is a small family run organic farm which is becoming distinguished for its high quality wines. The wine production is very limited: only 12,000 bottles a year. The 4 types of red wine are made exclusively from their own grapes. 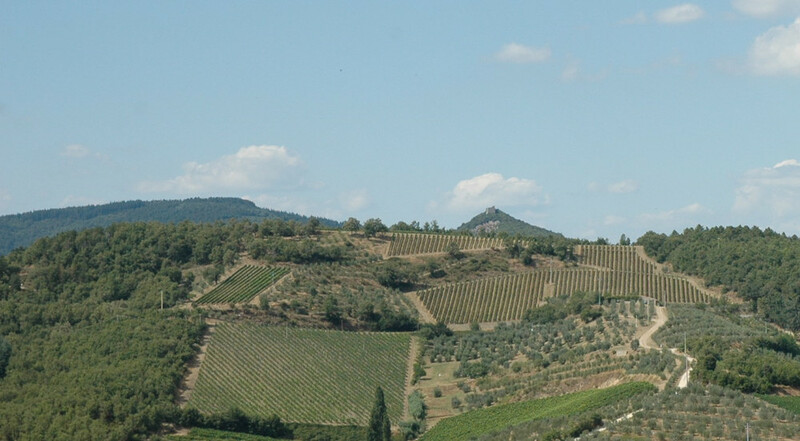 The vineyards are situated on the upper slopes of a hill at an average altitude of 550 metres facing south, with spectacular views towards Siena. The geology can be described as shallow top soil with a large proportion of shale, and bedrock lying beneath. By reducing the production to a minimum per plant each year through green harvesting and carefully selecting the grapes to use, they achieve perfect ripening. Only natural products are used in the vineyard and in the winery and personal care is taken at every step to ensure the highest standard. They were organically certified in 2009. The 22.5 hectare farm is made up of 3.8 hectares of vineyards. During the 10 years it was abandoned the land was not worked which allowed the soil to naturally reinvigorate itself. Now only cow mature from organic farmers is used to fertilize the vineyards, and winter barely is planned to absorb any excess nitrogen produced by the manure and to control the soil moisture content.